An overly familiar plot sets up an intriguing new direction on an otherwise average episode of Arrow. Warning: This contains spoilers. 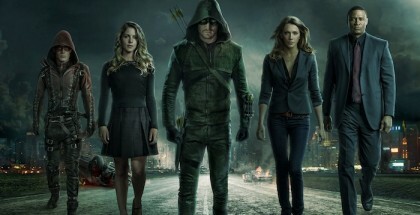 For how to watch Arrow, click here. 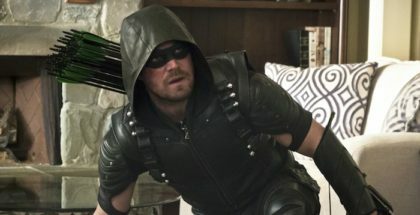 Arrow’s Season 6 premiere ended on a rather familiar cliffhanger, with Oliver’s secret identity being broadcast on the Channel 52 news, illustrated by a photo of him in the Green Arrow costume, without his mask on. Seasoned Arrow watchers no doubt rolled their eyes at this, because we’ve been here before, with credulity-stretching results. The first time round, Oliver managed to persuade the gullible people of Star City that The Hood and The Arrow were two completely different vigilantes, despite them looking exactly the same, hanging out with the same people and doing exactly the same things. On a subsequent occasion, he got the gullible people of Star City to believe that Roy Harper was the The Arrow, despite Roy Harper being at least a foot shorter. And let’s not forget the time he got Diggle to pass himself off as The Arrow. On the surface, the decision to embark on this particular story-line seems completely misguided, suggesting that the writers are completely unwilling to learn from this particular mistake, which is odd, because Arrow has a good record when it comes to course-correction in other areas. The fact that it comes on top of Season 6’s lame cop-out of Season 5’s sensational cliffhanger only adds insult to injury. But perhaps the writers know what they’re doing after all. The ending to this week’s episode certainly suggests that might be the case. 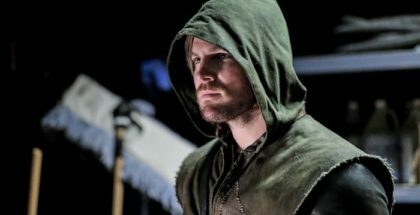 The episode begins with a clip that did the rounds on the Internet before the episode was broadcast, in which Oliver confronts Star City’s press corps and flat-out denies being the Green Arrow, saying photographs can be faked. (As it turns out, that’s exactly what has happened, but he doesn’t know that yet.) He then, somewhat bizarrely, name-drops Bruce Wayne, saying “They could have put Bruce Wayne’s head on that body. Has Bruce Wayne left Gotham to hang out in Star City recently?” On the one hand, it’s nice to finally get confirmation that Batman (or at least, Bruce Wayne) exists in the Arrowverse – we have already had a couple of Batman villains and a hint of Harley Quinn, after all. But, on the other hand, it’s a ridiculously clumsy reference because the context makes no sense – is Oliver just naming a random Gotham City figure just for the sake of it? It actually makes more sense if he’s talking about a fictional character from Batman comics, because at least then the Star City crowd would get the joke. But, hey, if it means legions of Batman fans binge-watching five seasons of Arrow in the hopes that the Caped Crusader might show up in Season 6, then mission accomplished. It is, of course, entirely possible that there will be a Gotham crossover at some point in the future, or that some form of Batman might show up in the upcoming Crisis on Earth-X four-part crossover, but frankly, we’ll believe that when we see it. Anyway, Oliver successfully deflects the accusation, only to run head first into FBI Agent Watson (GLOW’s Sydelle Noel), who’s come to Star City specifically to investigate the rumour that he might be the Green Arrow. And she looks like she means business. Oliver ends up warning her off, but no doubt we haven’t seen the last of her. Here’s hoping the writers use her to call out the ridiculously lame secret identity excuses they’ve used in the past. The main plot for this episode involves Anatoly showing up in Star City and causing all sorts of trouble for Oliver, largely by kidnapping a foreign delegation of Markovians for some reason. Oliver initially suspects Anatoly of leaking the photo, but Anatoly is nothing if not a man of honour, and he convinces Oliver that it wasn’t him. His main purpose in the episode is to serve as a reminder that he was once a father figure of sorts to Oliver, and to show that this side of their friendship is now in the past. Between Oliver having to deal with Anatoly as Green Arrow and the accusations about his secret identity as the Mayor, he has very little time for his son, William, and that comes to a head this week as Oliver comes to a difficult decision regarding his future. After giving William some dubious advice about how to deal with bullies (essentially, “pick the biggest one and punch him in the nose”), Oliver’s forced to reassess his own role as a new father and realises that it’s a full-time job and something’s got to give. Meanwhile, in the episode’s main sub-plot, Diggle is still dealing with the PTSD we saw him struggling with last episode. Except it turns out that the damage is not just psychological, it’s also neurological and his motor functions have been affected. Dinah initially goes along with Diggle’s decision to keep that from the rest of Team Arrow, but when his inability to pull the trigger nearly gets her killed in the field, it’s clear from the look she gives him that she’s not going to stay quiet for long. The episode’s other sub-plot feels like an interesting change of pace. It involves Felicity and Curtis discussing how everyone on Team Arrow pays their bills, given that vigilantism doesn’t exactly come with a pension plan and dental. Curtis reveals that he’s taken a secret job as a coder and Felicity is immediately jealous and probes him for details. 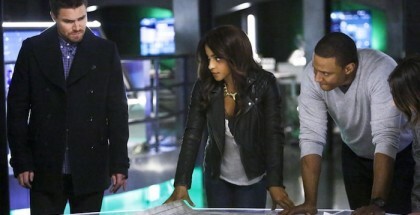 On one level, it’s just an excuse for Felicity and Curtis to out-nerd each other about programming, but it’s fun to see the show explore ideas that otherwise never get mentioned – Diggle, for example, apparently lives off Lyla’s ARGUS wage, the writers having apparently forgotten that he was once employed as Oliver’s official bodyguard. And if Oliver’s now the Mayor, surely it makes perfect sense for him to still employ Diggle as his bodyguard? Anyway, the Curtis and Felicity stuff ends with the pair of them agreeing to go into business together (something to do with computers), which should keep them busy for a few episodes or so. 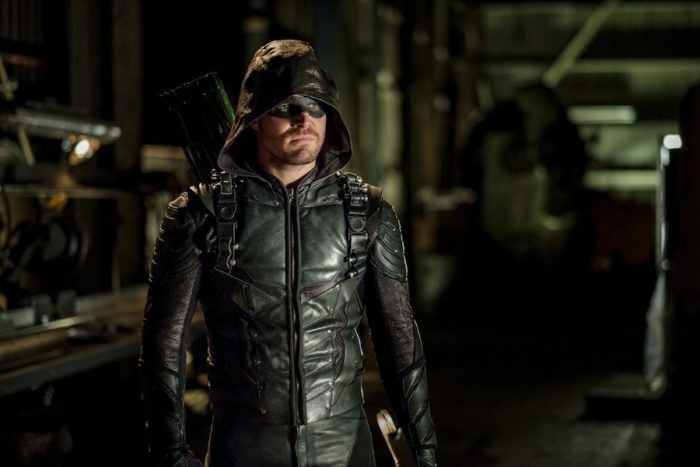 All of which brings us to the episode’s cliffhanger, in which Oliver decides to give up being the Green Arrow and asks Diggle to take over in his place. This would be the perfect time for Diggle to come clean about his neurological issues, but of course he doesn’t, which is a pretty effective cliff-hanger, because you’re immediately left wondering who’s going to get injured as a result of Diggle’s secrecy next week. It’s also fair to say that Oliver’s reasoning is rather insensitive – he effectively says, “I can’t be Green Arrow anymore because I have a son now”, when Diggle also has a son. That basically means Oliver is saying “Yes, but your son has both parents and can afford to lose one, while William only has one parent and that’s me, yeah?” And Diggle doesn’t even call him on it – he must really like that green costume. All in all, this is a pretty average episode. The Anatoly stuff doesn’t really go anywhere and the secret identity stuff is as tedious as ever, but the episode does manage to deliver some decent action sequences (courtesy of director Laura Belsey, who doesn’t go in for that fast-cutting nonsense and lets you see who’s hitting who), as well as the usual handful of funny lines from Felicity, Curtis and Rene. It remains to be seen just how long Diggle will last in the Green Arrow suit, but, at least for the moment, that represents a promising new direction for the show. Come back next time for Diggle’s first day on the job! – There were no flashbacks this time, which makes for a refreshing change. Last episode, it seemed like we were going to get ongoing flashbacks to what happened on Lian Yu, but since Diggle fills us in on the full extent of his injuries, that may not be happening after all. – No sign of Thea this week, not even a token visit to her bedside. Get well soon, Thea. The show isn’t the same without you. – No sign of Black Siren this week either, which means no further hints as to the identity of her mystery saviour. It’s hard to imagine the writers coming up with a suitably surprising Big Bad reveal at this point, so it’s probably best not to think about it too much. – Vigilante update! After disappearing without trace last season (having served as an effective fake-out for Adrian Chase’s secret identity), it looks like the writers haven’t forgotten about him after all and he’ll be back later this season. Hilariously, it turns out the producers haven’t cast the actor for the role yet, which means that it won’t turn out to be someone we already know after all. Unless… the Vigilante is a dry-run for Batman and it’s going to turn out to be Bruce Wayne? Okay, we’ll shut up now. Arrow Season 6 is available on Sky 1 every Thursday, within a week of its US broadcast. Don’t have Sky? 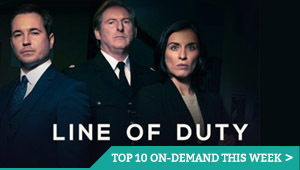 You can stream it live or catch up on-demand through NOW TV, as part of a £7.99 monthly subscription, no contract. A 7-day free trial is available for new subscribers.